Three people were arrested on drug charges Tuesday in the parking lot of a Target store in Salem, New Hampshire. 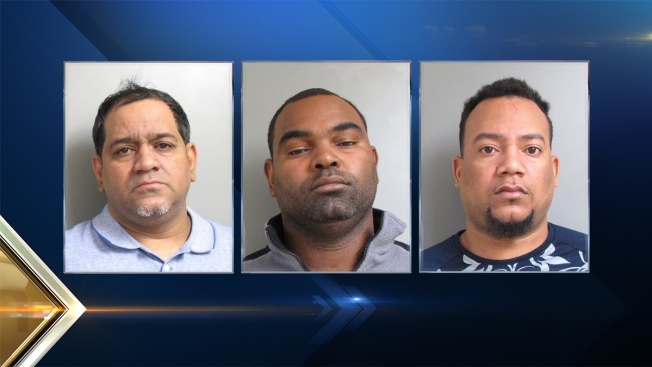 WIlfredo Laboy, 31, of Methuen, Massachusetts, was charged with sale of a controlled drug; Luis Ascona Hernandez, 46, of Lawrence, Massachusetts, was charged with possession of heroin and falsifying physical evidence; and Francisco Castillo, 37, also of Lawrence, Massachusetts, was charged with sale of a controlled drug and transporting drugs in a motor vehicle. Salem Police said the arrests came at the conclusion of a lengthy drug investigation involving large quantities of heroin and cash. The three suspects were arrested in the parking lot of the Target on South Broadway. As police attempted to take the men into custody, one of them fled through the store, while the remaining two attempted to destroy drugs. All three were eventually taken into custody, and 15 "fingers" of heroin with a street value of $4,500 were seized. Laboy was released to the custody of the U.S. Drug Enforcement Agency, Hernandez was released on $5,000 personal recognizance bail and Castillo was released on 3,000 personal recognizance bail. Hernandez and Castillo are both scheduled to be arraigned on March 28 in Salem District Court.